It was belated, it looked like a u-turn after a refusal only two months ago and may have been forced by parallel action from the South African authorities, but the New Zealand Rugby Union's apology for its exclusion of Maori players from three All Black touring parties to South Africa last century is still welcome. It came, by no coincidence, just in time to mark the centenary of official Maori rugby. The first official Maori fixture was played on May 21, 1910, a 25-5 victory over a Rotorua sub-union team. This year also marks the 50th anniversary of the third of those artificially whitened All Black tours - debate over which was marked by American satirist Tom Lehrer hailing the contest to be named 'the world's greatest non-pigmented rugby team'. Those pioneers of 1910 were not, of course, the first Maori team. The 1888 New Zealand Natives, a commercial operation, not only pioneered touring by southern hemisphere rugby teams, but took the concept to the staggering length of playing 74 matches and staying away for a year. Greg Ryan's Forerunners of the All Blacks remains the standard work for those wanting to know more. A member of that team, Tom Ellison, wrote the first New Zealand coaching manual and was responsible for proposing that national teams play in All Black. The official recognition of Maori rugby in 1910 gave formal shape, before the two countries had even started a rivalry that was a de facto world title fight for much of the last century, to a piquant element in New Zealand-South Africa rugby relations - that segregationist South Africa's greatest, most cherished rival was also the one significant rugby nation that routinely selected non-white players. 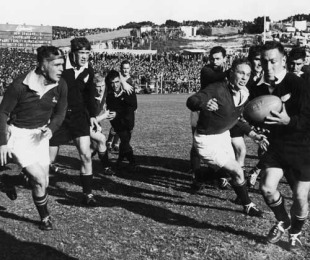 The apology by the NZRU, reported by historian Malcolm Mulholland as being welcomed by the families of eight players affected, reflects one consequence of that - New Zealand's acceptance in 1928, 1949 and 1960 of South Africa's ban on non-white players. It is belated recognition that when the NZRU did that, it was not merely failing to act as subsequent generations might have preferred, but betraying a principle which was always supposed to be basic to rugby's values - support for team-mates. If you reject my team-mate, you reject me. In leaving their Maori players - men like George Nepia in 1928, J.B. Smith in 1949 and Waka Nathan in 1960 - at home and still going to South Africa, the NZRU betrayed that most basic of rugby values. It also, by allowing South Africa to dictate the composition of those teams, did what it accused its critics of doing - letting politics into the game. "The real controversy came afterwards, when a report sent back to South Africa by Charles Blackett, a journalist accompanying the Boks, was leaked from the Napier telegraph office. Its wording created a storm in New Zealand: "Most unfortunate match ever played". It was a policy that has a bearing on debates on the greatest teams. Certainly South Africa had a very fine team in the contentious 1949 series, beating the All Blacks 4-0. They were good in 1960, when the All Blacks were beaten 3-1. But those achievements were against under-strength All Black teams, deprived of giants like Smith and Nathan. More than ever the shining light is the 1937 Boks, who beat a full strength All Black team on their own soil, becoming for years after the punchline to the question about 'the finest team ever to beat New Zealand'. It also gave a definite edge to matches between touring Bok teams and the Maoris. Last month Maru Walters, now an Anglican bishop, said that one reason for the shattering 37-0 defeat suffered by the Maoris in 1956 was that Ernest Corbett, Maori Affairs minister in the New Zealand government had come into the changing room and instructed them to lose: "It ripped the guts out of our team", he recalled. Another team member, Tiny Hill, has questioned the story. If that took more than 50 years to emerge, the controversy over the first Maoris-Boks clash, at Napier in September 1921, was much more immediate. The match itself was fiercely contested, laying down the tradition - much in evidence more recently - that the Maori match has the intensity of an additional test. The Boks won 9-8 in a contest memorable for the ferocious commitment of the Maori pack and controversy when the referee denied the Maoris a mark that, under the rules of the time, would have given them the chance to drop a match-winning goal. The crowd was furious when he not only disallowed the mark, but the South Africans promptly regained possession to score their winning try. Yet the real controversy came afterwards, when a report sent back to South Africa by Charles Blackett, a journalist accompanying the Boks, was leaked from the Napier telegraph office. Its wording, in the original telegraphese, created a storm in New Zealand: "Most unfortunate match ever played…. Bad enough having to play a team officially designated NZ Natives, but spectacle thousands Europeans frantically cheering on band of coloured men to defeat members of own race was too much for Springboks, who frankly disgusted." The South Africans and the journalist protested about the leak - although as Spiro Zavos points out, news of the report would rapidly have reached New Zealand anyway - and claimed elements of selectivity in the quotation, but did not contest the substance. It was, for many New Zealanders, a shocking insight into South African attitudes, although as Zavos points out it had the effect of making some administrators believe that taking the line of least resistance and bowing to the exclusion of Maoris from touring parties to South Africa in 1928 and later was sparing them potential humiliation. The hope must be that a centenary season highlighted by matches against Ireland and England will pass off much more happily. The apology, much better late than never, looks like a decent start.